Electronics Industry Related｜Sumitomo Chemical Engineering Co., Ltd.
Sumitomo Chemical Engineering Co., Ltd.
From the second half of the 1970s, SCEC commenced research and development in the area of automated chemical supply equipment, a time when semiconductor manufacturing began to go into full swing. In 1981, it delivered its first such equipment units. Since then, SCEC has supplied numerous safe and stable systems, mainly centering on this system, and in this way it is contributing to stable operation and labor saving at its client's plants. 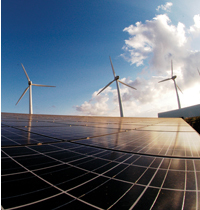 Currently, SCEC supplies these systems to clients in Japan and seven other countries, and SCEC has earned an excellent reputation, both in Japan and worldwide. Chemical supply systems must be safe and be able to ensure a constantly stable supply of chemicals to plants which now mostly operate on a continuous 24 hours a day 365 days a year basis. 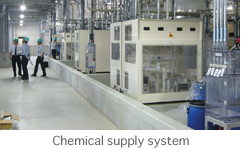 Chemical supply systems are a major area of strength for SCEC, and it has extensive experience with over 1,500 such units delivered. SCEC has also provided after-sales services for many years, and this has given it a wealth of diverse experience. SCEC has stored this accumulated experience in the form of know- how and constantly feeds this back to its system development and after-sales services. 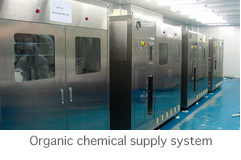 In this way, SCEC supplies extremely reliable systems matched to the properties of the chemicals involved. SCEC is ready to respond to even greater diversification in client needs, and by creating even better systems, SCEC seeks to ensure total client satisfaction.